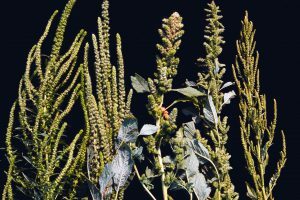 Palmer amaranth is a highly competitive pigweed with herbicide resistant populations that are problematic in many states. Much of the Palmer in the US is resistant to glyphosate, and it is common for plants to be resistant to ALS-inhibitor herbicides as well (examples include Pursuit and Classic). This species grows very rapidly, and even effective herbicides are not likely to kill Palmer seedlings that are over 6 inches tall. If it is allowed to grow above 6 inches, farmers must move to other tactics including hand-pulling, mowing, burning, and cultivation. if the plants are not terminated somehow, they will produce up to 600,000 seeds per plant that survive in the soil and continue the cycle of weed issues next year. 3) Avoid relying on products that Palmer is frequently resistant to, like glyphosate and ALS-inhibitors. 4) Use multiple effective herbicide modes of action, and don’t rely heavily on just one or two. 5) Employ a zero tolerance policy – make sure no plants are left by harvest: Hand pull, remove from the field, and burn or bury. 6) Combines spread Palmer amaranth. Avoid using combines that have recently been in fields with Palmer, as they will spread the infestation to the clean field. 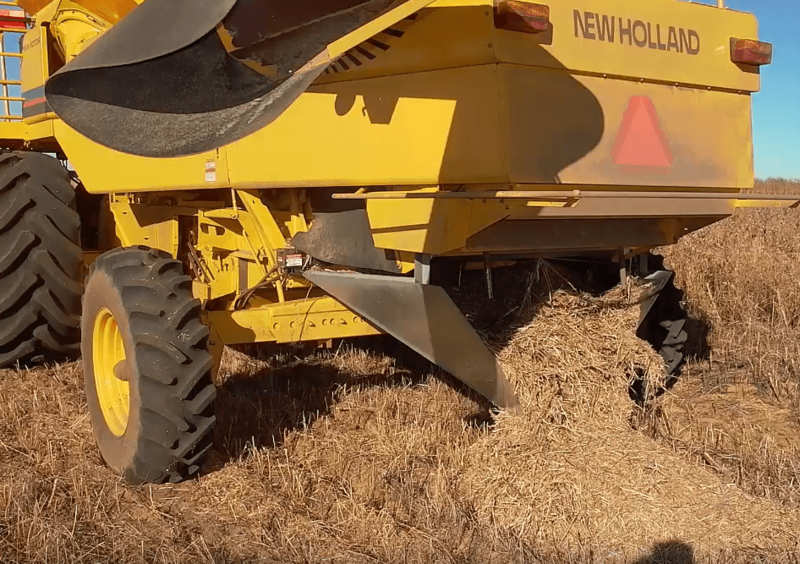 Contaminated combines should be cleaned after harvesting a field with Palmer. Consider not harvesting heavily infested areas, because harvesting the crop and spreading weed seeds from that part of the field may not be economical compared to the increased weed management cost of controlling a larger infestation. A huge volume of resources are available to provide management recommendations for Palmer. Many are listed below. 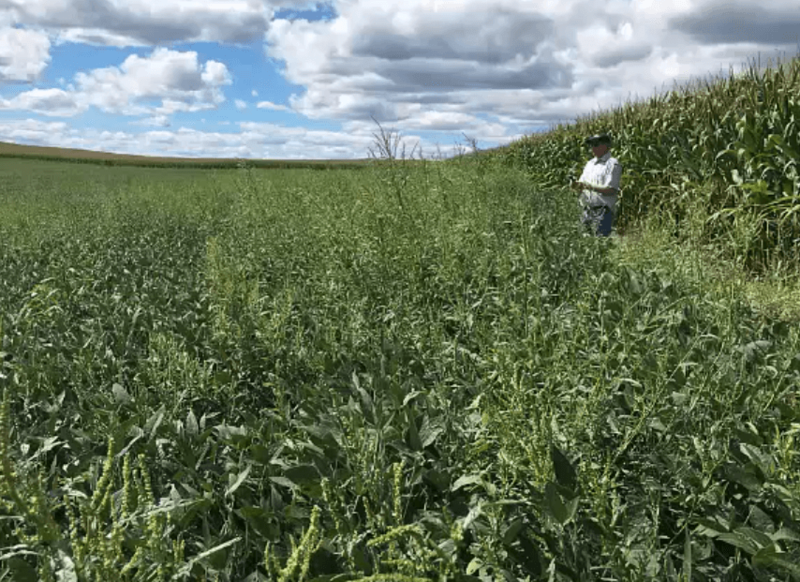 For reasons stated above, an herbicide-only approach is not likely to manage Palmer amaranth, especially if the plants are allowed to grow above 6 inches tall and/or if herbicide applications fail. It keeps emerging for many weeks into the growing season, so herbicide approaches may require multiple passes. In the long-term, repeated applications of the same herbicide to Palmer will most likely lead to the selection of plants that are resistant to it. Although dicamba is currently regarded as effective against Palmer, research at the University of Arkansas has already shown that plants can become resistant to dicamba after a few generations are sprayed with it. 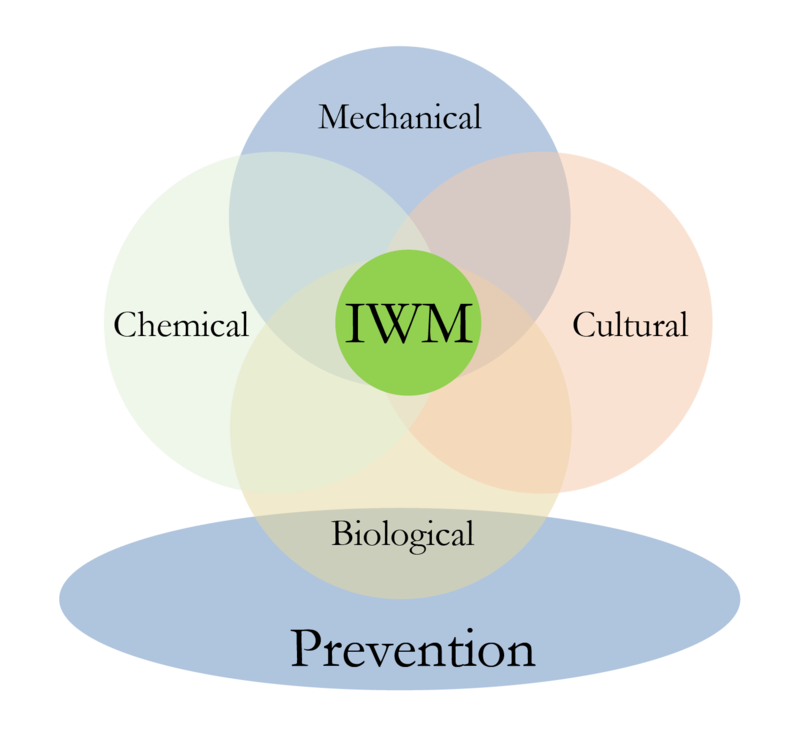 Therefore, it is essential to approach Palmer expecting to integrate multiple weed management tactics. A recent multi-state study showed that tillage-based weed management programs are most powerful against Palmer when they combine a PRE residual herbicide program with deep tillage using a moldboard plow. Palmer amaranth has hairless stems. Redroot pigweed and smooth pigweed, on the other hand, have tiny, fuzzy hairs on the stems. On newer stem growth, these hairs often feel and appear similar to peach fuzz. However, as redroot pigweed plants grow, their hairs become less evident on the woody stems. So, find some young growth toward the top of the plant or the ends of branches to determine if the plant indeed does have hairless stems. If the plant has hairless stems, you can further confirm it’s identity as Palmer amaranth by examining the leaves. 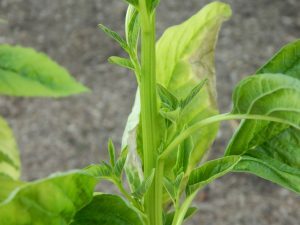 On Palmer amaranth, the petioles are often longer than the leaf blade itself. 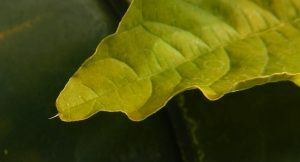 The petiole is the thin stalk that connects the leaf blade to the stem. 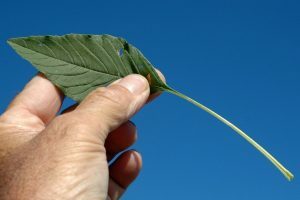 Palmer amaranth leaf blade and petiole. Photo: Penn State. 3. If the plant has produced seed heads and flowers (called influorescences), you can use them to readily distinguish Palmer. Palmer’s influorescences get quite long compared to those of other pigweeds. Redroot and smooth pigweed influorescences are small and clumped. Pigweed seed heads. From left: Palmer amaranth, Powell amaranth, redroot pigweed, smooth pigweed, and waterhemp. Photo: Aaron Hager. 4. Sometimes, Palmer amaranth leaves have a single small hair at the tip of the their leaves. 5. Palmer amaranth leaves look quite similar to leaves of redroot and smooth pigweed. However, they can be distinguished from waterhemp by their shape. Palmer leaves are more rounded, while waterhemp leaves are relatively longer and slim.